Data cabling is essential for businesses and residential properties to benefit from a structured and reliable data performance. We future proof your data cables to ensure you have maximum speeds at all times, so you can concentrate on work and leisure. At Woodstock IT we assess your current data cabling and can terminate and install new structured data cabling to ensure everything is working to top speeds and is properly maintained for your security and safety. State of the art data cables for businesses and residential properties are essential to allow reliable access to more data and resources. In essence, data cables allow the transfer and use of digital data and are an effective telecommunications infrastructure for your desktops, telephones, video conferencing and any connected devices. Data cables have capacities which need to match your data use and include ethernet cables and fibre optic technology. We have a wide range of experience in configuring and improving data cabling networks for companies, whether a one person operation, or a large business with multiple teams requiring effective data access. 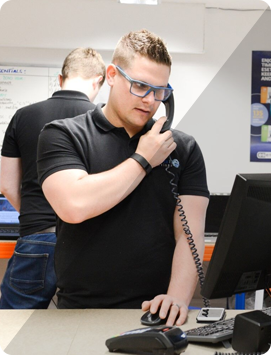 Particularly important if you’re a growing business, our services install cabling to allow you to expand smoothly with resources to meet the demand of increased staff numbers and connected devices. After an initial consultation, we provide you with a quote for your tailored data cabling plan, whether improvements or a full install, and create a CAD drawing for approval before work begins. Our fully trained staff operate to the highest of standards and all installations come with warranties and are accurately tested for the best results. Once we have spoken with you and assessed your system requirements now and in the near future, our infrastructure design will ensure you get the best day to day results from your network. As a business owner, improving your current setup ensures employees are productive and are not delayed through IT issues and poor connectivity, and for home owners, it ensures a stress-free family environment when it comes to enjoying fast broadband. With versatile options such as single and multi mode, Cat5E and Cat6 UTP solutions, you can be sure we will design the best system for your needs. At Woodstock IT, we operate a transparent service and keep you up to date with our work, meaning you know exactly what you’re getting and how it will benefit you. For more information, please call us on 01403 290 321 or 01293 912 321. We’d love to discuss your requirements and how we can improve your current data cabling throughout Sussex and Surrey.